After years of waiting for Apple to release a decent Mac Mini update, I simply ran out of time. If I was to continue with creating new applications for iOS devices, I needed something that could run Xcode 9. My Mac Mini (Early 2009) simply wasn’t good enough. Apple was basically saying upgrade or die. So, I upgraded. My main computer is now a 2017 MacBook Air. It’s a great computer, but it has one major issue. It only has a 128 GB of storage space. Here are the words that created the problem. Starting April 2018, all new iOS apps submitted to the App Store must be built with the iOS 11 SDK. While I don’t see what’s so special with macOS 10.12 and 10.13, my Mac Mini is stuck on 10.11. That was the end of the line for my Mac Mini. In April, iOS development will require Xcode 9 and Xcode 9 requires macOS 10.12. After a nearly decade long run, a hardware upgrade was needed. Fortunately, Best Buy was having a Presidents Day sale. 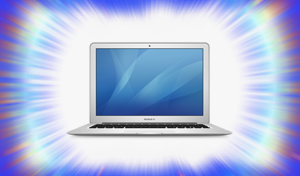 A 13″ MacBook Air was only $750. That’s an insane price for a new Mac laptop. That’s especially amazing considering that a 13″ MacBook Air, back in 2008, was $3,098. If that’s a hard factoid to believe, here’s the link to archive.org. Now you might be thinking, “Hey Mike, what does this have to do with storage space?” Don’t worry! I’m setting the scene. This article is for those that are frugal. It’s about optimizing resources. Economizing isn’t about doing without. It’s about doing the best you can with what you have. There’s probably amazing Apple hardware in the pipeline, but is it going to deliver the same dollar-to-performance ratio as a $750 MacBook Air? It’s fairly routine to gauge the overall computer performance value, but what about the value of the individual pieces? Did you know that an official MagSafe 2 power adapter, direct from Apple, is $79? That’s crazy. That’s 10% of the computer. With that mindset, how much does storage cost? Other World Computing (OWC), at the time this article was written, offers a 240 GB hard drive (compatible with the 2017 MacBook Air) for $239.99. That means, in today’s dollars, 1GB of storage is roughly equal to $1 in expense. This is just an approximation for average computer use, not giant server farms. The 1GB = $1 comparison is just to give you a general idea that storage space has value. 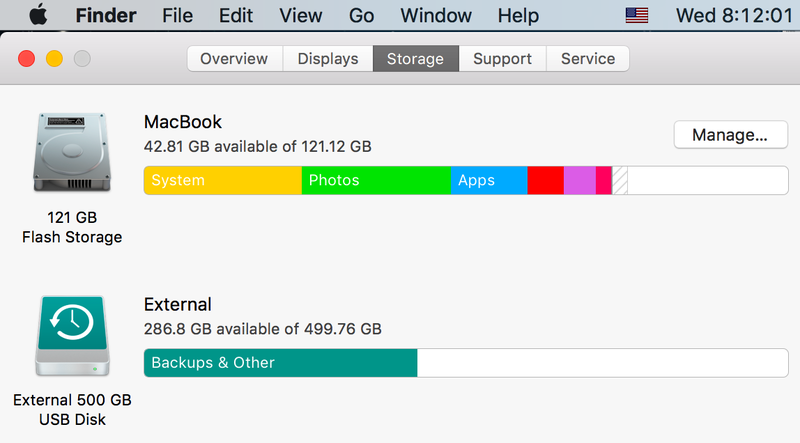 Too much storage is not a likely critique for the 2017 MacBook Air. The base model includes a paltry 128 GB of storage space. Isn’t that too tiny? It’s definitely cramped. Yet, with the following 10 steps, I managed to add a significant amount of storage space – for a total of 35.5 GB of free space. That’s 25% of hard drive space is available. That’s enough space to let the drive to run the operating system properly, but not too much so that the storage space is wasted. This is not a lot of space, but it would be far worse without economizing storage. OK, enough chit-chat. Here are the space saving steps. There are two main ways to identify large files. The first is to open a folder and sort the contents by size. You can target the biggest offenders of storage space and determine if you really need to save this data. Perhaps the large files can be offloaded to another computer or an external storage device. Maybe some files could be deleted entirely. This is a personal judgment call. But generally, if a computer is brand new, lots of unnecessary data was likely included. It’s important to remember that storage space is separate from CPU power. Deleting files probably won’t speed up your computer. Excessively deleting files does not equal more speed. While a stuffed hard drive can cause speed problems, you don’t need to erase everything in site. This is about balance. It’s about keeping what files you need, while keeping your computer running optimally. Quite often, the “Size” column could be lacking data. 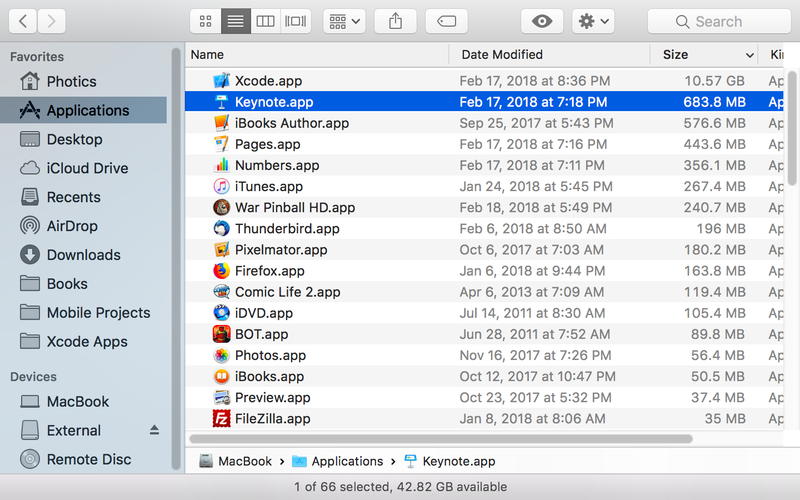 By default, macOS does not compute the size of directories. If you want to display this data, open the folder you want to sort. With the folder window open, select View > Show View Options from the “Finder” menu. There’s an option to “Calculate all sizes“. This is an intensive task, which is why it’s off by default. But if there’s a particular directory you want to look at closely, this is a useful option. Once you’re done, it might be a good idea to uncheck the “Calculate all sizes” option. Fortunately, for those running macOS Sierra (10.12) or High Sierra (10.13), there is a better way to identify large files. Click the Apple icon at the very top left of the desktop. Select the “About This Mac” option. This will bring up a new window with five tabs. From the “Storage” section, there is a “Manage” button. There are lots of options to reduce storage space usage. Apple makes suggestions, which leads into the next step. My iMessages were being stored “Forever”. This seemed unnecessary, as that was being done on all of my Apple devices. Do I really need an archive of every message I’ve sent? Well, I certainly didn’t need three copies of it. Since the iPad and the Mac had incomplete copies of the messages, I simply edited the iMessage app preferences. By setting the “Keep messages” to “30 Days” instead of “Forever”, over two gigs of storage space was recovered. Previous Previous post: Does Apple Love Developers?